Serine is a nonessential amino acid that plays a role in synthesis of DNA and RNA, and is also involved in modulation of the NMDA receptor. While there are two main isomers of serine (D-serine and L-serine), humans metabolize the D-serine isomer better. Serine can be obtained from natural sources from the diet (mainly in meat, dairy and wheat based foods) or from supplementation (the most common way is via glycine supplementation). D-serine has been found to improve cognitive function with respect to attention, executive function and mood in many human subject studies. Serine is an amino acid that contains a hydroxymethyl group side chain. It is a nonessential amino acid synthesized in the human body. It is heavily involved in the biosynthesis of purines and pyrimidines, which are essential building blocks of DNA and RNA. Furthermore, D-serine is a co-agonist with glycine for the NMDA receptor.1,2,3There are two isomers (D-serine and L-serine) of serine, however typically for supplementation humans metabolize L-serine. Upon ingestion, L-serine is racemized into D-serine. Figure 1. 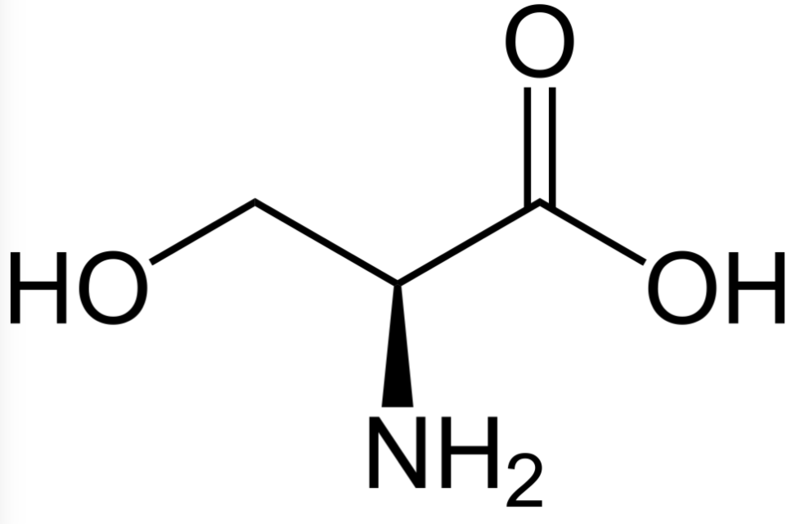 Serine is an amino acid that contains a side chain in the form of hydroxymethyl group. Furthermore, L-serine can be added to a glyercol lipid molecule to form phosphatidylserine. Phosphatidylserine plays a role in many bodily functions including nerve cell repair and structural integrity, improvement in nutrient absorption, and improvements in cognition with respect to memory, stress levels and mood. It is important to note that there are two isomers of serine: L-serine and D-serine. L-serine is converted to D-serine in the the glial cells (the support cells of the nervous system). Typically, L-serine is synthesized from other amino acids such as glycine, or from other protein metabolites. L-serine typically sold as a dietary supplement, while D-serine is not. L-serine is classified as a Generally Regarded as Safe (GRAS) compound by the FDA, while D-serine is not. Despite the fact that D-serine is not a GRAS compound, there is a growing body of literature that suggests it is beneficial for boosting cognition with respect to attention, memory and mood. Serine has been found to improve memory and executive function in healthy adults. Most of the studies out there focus on the effects of D-serine. Figure 2. D-serine administration has been shown to increase scores on the Continuous Performance Test–Identical Pairs (CPT-IP) test, a test for working memory. 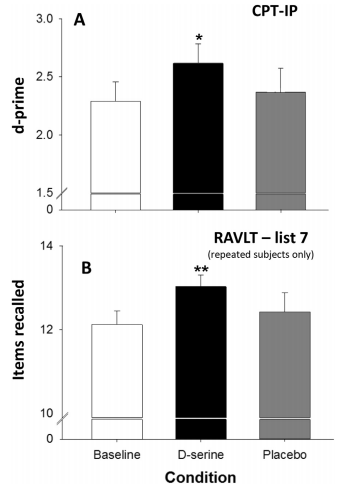 Furthermore, D-serine administration led to a 10% improvement in performance on the Rey Auditory Verbal Learning Test (RAVLT) compared to placebo. 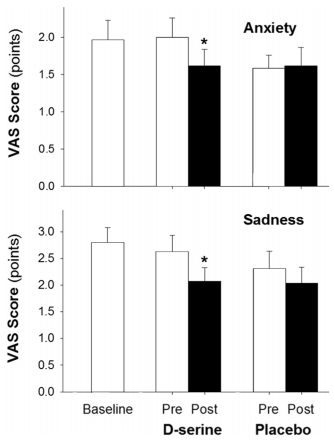 Furthermore, it was found that D-serine administration resulted in more significant decreases in scores for anxiety and sadness compared to placebo (Figure 3). Figure 3. In a study of 35 young adults, it was found that administration of D-serine resulted in improvements in mood with respect to anxiety and sadness. Specifically, significant decreases in anxiety and sadness were seen after administration. L-serine is naturally produced by glial cells of the nervous system. Glial cells are the support cells of the nervous system that aid in the potentiation of action potentials between neurons. L-serine is converted to D-serine in the glial cells via the enzyme serine racemetase. Regarding dietary supplementation, L-serine supplements can be consumed. Furthermore, serine can be found in soy protein powder (4.5g serine per 100g).5Typically, L-serine is converted to D-serine in the body. D-serine in turn carries effects on cognition and metabolism. L-serine has a Generally Regarded as Safe (GRAS) designation by the FDA. While there is currently no clear evidence on the maximum tolerable daily dose of serine, studies involving up to 30 mg/kg daily intake do not report serious adverse effects. When taken in safe quantities, serine can be beneficial for long-term improvements in executive function and memory. Note that it is important to maintain adequate levels of serine in the body, as serine provides many functional benefits for cognition as well as metabolism and immunity. Henneberger, C., Papouin, T., Oliet, S. H., & Rusakov, D. A. (2010). Long-term potentiation depends on release of D-serine from astrocytes. Nature, 463(7278), 232-236. Wood, P. L. (1995). The co-agonist concept: is the NMDA-associated glycine receptor saturated in vivo?. Life sciences, 57(4), 301-310. Levin, R., Dor-Abarbanel, A. E., Edelman, S., Durrant, A. R., Hashimoto, K., Javitt, D. C., & Heresco-Levy, U. (2015). Behavioral and cognitive effects of the N-methyl-D-aspartate receptor co-agonist D-serine in healthy humans: initial findings. Journal of psychiatric research, 61, 188-195. Avellar, M., Scoriels, L., Madeira, C., Vargas-Lopes, C., Marques, P., Dantas, C., ... & Panizzutti, R. (2016). The effect of D-serine administration on cognition and mood in older adults. Oncotarget, 7(11), 11881-11888. Gebhardt, S., Lemar, L., Haytowitz, D., Pehrsson, P., Nickle, M., Showell, B., ... & Holden, J. M. (2008). USDA national nutrient database for standard reference, release 21.